Cleaning up can be hard work and boring, but it doesnt have to be with the house clean up rooms game. 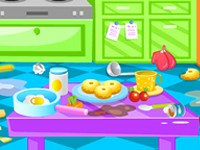 This clean up game allows you to clean the kitchen, bedroom and more in a fun and exciting way. Here you can clean up spills, put rubbish in the bin, place items back on the shelves, sweep/vacuum the floor, and so much more before you run out of time.